American Walnut and precision-tuned brass. Black finish, .177 caliber pump. Things I liked: This pistol does have a nice feel about it. Also there is the nastalgia factor. However, the honeymoon will be over quickly. Things I would have changed: My gun shot consistantly to the left. The rear sight cannot be moved enough to help. The trigger is creepy and rough. The paint flaked off in my hands almost immediatly. The pin that holds the pump handle missed the other side when driven through and flared out the metal. The overall fit and finish is poor,nothing like an original Benjamin. For the money spent I was not happy. 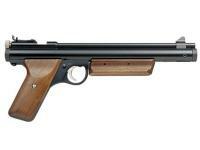 I told Crosman if they are not going to do this model right they shouldn't do it at all. What others should know: I returned the gun to Pyramid and the were very professional and understanding. They gave a full refund. I purchased a Crosman 2300T. I am very pleased this this gun and will review it soon. For the money spent the 2300 is a much better buy! Things I liked: Classic design, no plastic, all metal and wood. Accurate. Nice fun classic gun. Things I would have changed: The slot on the rear sight is rather wide in reference to the front sight width. I dealt with this by fitting the 272 intermount, medium rings and the BSA 2x20 scope. Much more fun with an accurate sight on this accurate gun.